Newt Artemis Fido Scamander reminds us that without animals, Earth isn’t a place called home. Newton (“Newt”) Artemis Fido Scamander went down in wizarding history for many of his achievements, including writing the seminal Hogwarts textbook Fantastic Beasts and Where to Find Them and bringing about the ban on experimental breeding. But after the biopic on him, I think Scamander will, perhaps, be best remembered in the muggle and No-Maj world for his wildlife conservation beliefs. In the movie Fantastic Beasts and Where to Find Them, magizoologist Scamander (played by Eddie Redmayne) comes to New York in 1926 with a suitcase full of magical creatures. Things begin to unravel when some of these fantastic creatures escape into the city, plus there’s an inexplicable force wreaking havoc at the same time. Fantastic Beasts is a charming film, full of wondrous bits. It’s set in the familiar world of magic, but with a new narrative that also makes a strong case for conservation. In the eponymous book that JK Rowling published as a Hogwarts School of Witchcraft and Wizardry textbook in aid of Comic Relief UK in 2001, we first learned about Scamander who, at the age of seven, “spent hours in his bedroom dismembering Horklumps” and then went on to travel across dark jungles, marshy bogs, and bright desserts to learn more about the “curious habits of beasts”. I couldn’t help but imagine Scamander as a cross between David Attenborough and Gerald Durrell. More so, when we got to examine the contents of his suitcase in the movie.The suitcase (spoiler alert) is a world unto itself for magical creatures, and it’s reminiscent of the many animal rescue and rehabilitation centres around the world. Such as the Wild Animal Rescue and Rehabilitation Centre on the outskirts of Pune, managed by The Indian Herpetological Society (IHS) that offers specialised care for injured and orphaned animals, and helps rehabilitate wild animals back into their natural homes. Or Wildlife SOS’s Agra Bear Rescue Facility, a centre for rescued sloth bears. Like Frank - the thunderbird, many of these animals have been trafficked or chained up and some will be returned to their homes in the wild. In his book, Scamander questions the wizarding world’s earlier attempts at designating non-human magical creatures as “beasts”, as compared to “beings”. “Being”, he says, is a creature worthy of legal rights and a voice in the governance of the magical world. A stark contrast to the idea of speciesism, an idea that humans have greater moral rights than animals. These are concepts we should reflect upon – as the planet hurtles towards a warmer period that is hastening the loss of biodiversity, as the green light is given for forests (home to the muggle fantastic animals) to be cleared for “development” projects, and as we enter the Age of Extinction for many species. The destruction is apparent, as are its consequences. The year 2016 is set to be the warmest in temperature records since 1880; climate change may be the reason behind the extinction of the small mammal Bramble Cay melomys in the Great Barrier Reef; and in India, we are already looking at horrific pollution levels and unprecedented weather patterns. In a paper titled "The New Noah’s Ark", research scientist Ernie Small pointed out that “Most of the world's species at risk of extinction are neither particularly attractive nor obviously useful, and consequently lack conservation support. In contrast, the public, politicians, scientists, the media and conservation organisations are extremely sympathetic to a select number of well-known and admired species, variously called flagship, charismatic, iconic, emblematic, marquee and poster species.” Another thing that we can take away from Fantastic Beasts. A friend pointed out that she loved that not all that animals in the movie were cute or even attractive. “Because it sort of drove the point home that you don’t preserve animals just because they’re photogenic,” she said. Whether it’s the enormous erumpent, the luminescent ashwinder, or the fragile bowtruckle, they are all as important for Scamander, like the tree frog, the grey hornbill, and the royal Bengal tiger are for wildlife conservationists. In fact, as Scamander writes, “Imperfect understanding is often more dangerous than ignorance”, and that’s often what determines our interactions with nature. Superstitions about unlucky owls, myths of the potency of the rhino’s horn or the fallacy of speciesism has led to owls being injured by stones, birds being imprisoned in tiny cages, and rhinos being poached to near-extinction. When it comes to his fantastic creatures, Scamander says that he hopes to, “rescue, nurture and protect them”, and gently attempt to educate his fellow wizards about them. And let us hope, some Muggles along the way. Which is what Fantastic Beasts really manages to do – remind us that without these animals, the world would be a much drearier place to live in. 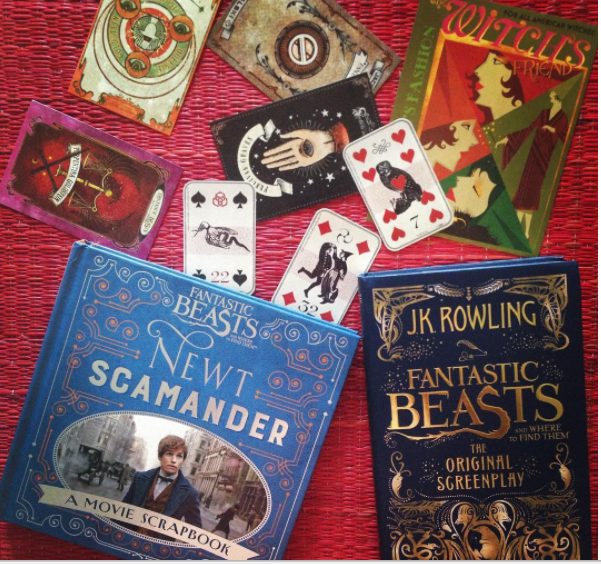 Scamander writes that magizoology matters because it ensures that “future generation of witches and wizards enjoy their [fantastic beings] strange beauty and powers as we have been privileged to do”. Our planet would be a poorer place without house sparrows taking a dust bath, a funnel web spider spinning her web with a funnel at its centre, or a mother elephant protecting her calf by gently pushing him behind her trunk. Without them, Earth isn’t a place called home. Why should grown-ups have all the fun?